Ring-tailed lemurs are named for the distinctive, alternating black-and-white bands along their tails. They reside in southern and southwestern Madagascar and are found in social groups called troops. This species uses both vocal and scent marking as tools of communication. Ring-tailed lemurs are active in the morning and generally sleep in the early afternoon, becoming active again in late afternoon before settling into a sleeping spot after sunset. In the morning hours, they enjoy sunbathing, sitting with their legs outstretched and stomachs facing the sun. Approximately 40 million years ago, ancestral lemurs arrived on the island of Madagascar, most likely rafting on vegetation washed to sea from the major rivers of the African continent. Once established in Madagascar, the group evolved into more than 40 different species, all of which occur only on Madagascar. When they travel throughout their home range, ring-tailed lemurs keep their tails raised high in the air, like flags, to help keep their troop together. Of all lemur species they are the most terrestrial. At least 15 different calls are also used in troop communication. Ring-tailed lemurs also have powerful scent glands and use their unique odors as a communication tool, signaling to members in their troop as well as warding off rivals. Males and females weigh about the same, ranging between 4.9 and 7.7 pounds. Their ears are slightly more prominent than those of other lemur species, and they have special teeth in their lower jaw, called a “dental comb,” which they use to groom their (and other lemurs’) hair. Lemurs are well adapted for life in the trees due to their grasping fingers and toes and semi-opposable thumbs. Their tails are long, measuring about 23.6 inches, but are not prehensile. The tail is primarily used for balance and as a visual signal. Ring-tailed lemurs live in groups known as troops. Ring-tailed groups are larger than any other lemur group, ranging from 6 to 30 animals, but average about 17. Both sexes live in troops, but a dominant female presides over all. The alpha female lives in one group for the entirety of her life, while males migrate from group to group. Male ring-tailed lemurs are equipped with scent glands on their wrists which are used in “stink fighting” with rival males. 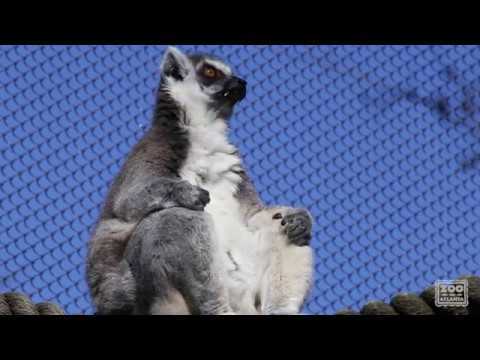 During mating season, male lemurs battle for dominance by trying to outstink each other. They repeatedly draw their tails through these glands and proceed to wave the tails over their heads, all the while staring in a hostile fashion at their rivals. Like all other diurnal lemurs, ring-tailed lemurs are seasonal breeders, mating and giving birth between April and June. Gestation lasts 4 to 4.5 months. Single births are most common, but twins are not unusual. Newborns cling to the mother’s stomach, eventually beginning to ride on her back. Newborn ring-tailed lemurs have blue eyes that turn golden-brown as they mature. Juveniles start becoming independent when they are around 1 month old and are fully weaned by 5 to 6 months old. On average, ring-tailed lemurs live between 18 to 23 years in the wild and between 20 to 30 years in zoological settings. Southern and southwestern Madagascar, with an additional population to the southeastern plateau of the Andringita Mountains. This species generally is associated with rainforests, especially dense areas near water. However, other habitats are also used, such a dry forests and scrublands. Ring-tailed lemurs are known to consume up to 50 different plant species. Pods from the Kily tree are a favorite, and these primates can be possessive over fallen fermented pods. Fruits, leaves, flowers and, more rarely, sap, bark or insects also contribute to their diet. They get most of their water from dew or rainwater in the treetops, coming to the ground to drink only when necessary. At Zoo Atlanta, we offer leafeater biscuits, which contain many of the vitamins, nutrients and protein they need to maintain a healthy lifestyle. We also offer vegetables including greens, zucchini, squash, green pepper and broccoli, and fruits such as apple, pear, banana, grapes, mango and melon. The Living Treehouse habitat is filled with large trees, simulating the lemurs’ habitat on the island of Madagascar. Various enrichment devices, such as swing poles, rings, and ropes, are scattered throughout. Keepers will also occasionally introduce novel food treats, such as peanut butter, or scents such as vanilla, for enrichment. Many lemur species are on the brink of extinction. With 91 percent of all lemur species and subspecies classified as Critically Endangered, Endangered or Vulnerable on the International Union for the Conservation of Nature (IUCN) Red List of Threatened Species, lemurs are the most threatened group of mammals worldwide. Madagascar, the only place in the world where lemurs are found, is home to 110 species of lemurs and is a global hotspot of biodiversity. Only 10 percent of Madagascar’s land area remains as suitable primate habitat. Lemurs are threatened by habitat loss and deforestation, and they could be extinct in 20 years without targeted conservation efforts.